ContiTech, part of the Continental Group, will appear at IAA Cars 2015 with various plastics and rubber solutions aiming to achieve lower fuel consumption, reduced CO2 emissions and enhanced comfort for vehicles. 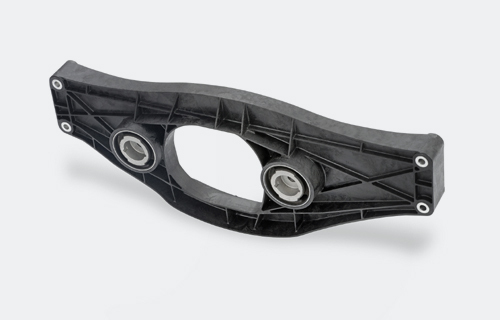 The highlights in its “Environment” exhibition area will include a rear-axle transmission crossbeam made from polyamide (PA), a double-sided timing belt for balance shafts, and a modular hose line for turbochargers. Using BASF’s glass fiber reinforced Ultramid PA, ContiTech developed a transmission crossbeam for the rear axle that is used in the Mercedes-Benz S-Class. The new variant is reportedly 30% lighter than diecast aluminum versions. As a central component of the rear axle, it supports forces and torques of the rear axle transmission. The component boasts high strength, reduced vibrations and noise and better crash protection, according to the company. ContiTech has also developed a new double-sided timing belt to drive balance shafts. The product can also run in an oil-based environment. The teeth on the belt’s rear side transmit the reverse direction of rotation of the crank shaft to the balance shaft. Compared with spur gears or chains, the belt is lighter and quieter as well as more flexible with regard to the positioning of the balance shafts in the engine. Balance shafts improve the engine’s smooth running and enhance the driver’s comfort in modern three- and four-cylinder engines in particular. To operate ancillary units such as air conditioners, steering assistance pumps, and generators, ContiTech also offers a wear-resistant and quiet V-ribbed belt in the form of the Unipower Tough Grip. Its pulley side consists of a fabric reinforcement and is thus highly resistant to wear – as is necessary in starter generator applications, for example. ContiTech produces the belt using a solvent-free manufacturing method. Another highlight of ContiTech is a new modular hose line for turbochargers that saves 15% in weight as it features a high performance plastic instead of a steel pipe. The hose lines for diesel and gasoline engines suit the narrow contours in the engine compartment, are temperature-resistant up to 220°C, and pressure-resistant up to 2.6 bar. In the diesel version, different components to optimize the noise level are available. At IAA Cars 2015, ContiTech will also present its latest findings from research in the use of natural rubber from the roots of the dandelion plant for vibration and mounting elements. As said, the raw material will grow in the poorest of soils and even in the colder regions of northern Europe, which would obviate the need for transport from tropical countries and improve the carbon footprint. The initial testing showed that dandelion rubber would fit for use in vibration and mounting elements in vehicles, such as on engine mounts. Products are expected to be ready for production in the next five to 10 years. IAA Cars 2015 will be held in Frankfurt, Germany from September 17-27.